Friends and furiends, today I want to talk to you about a very important subject: water. It is second in importance to our survival only next to oxygen, yet many of us don’t drink much of it. We just don’t seem to have a strong drive to drink. Why is that, you wonder? It is because, in nature, we would get most of our water from our food. If we got our water from our food, we wouldn’t need to drink much water. Cats drinking water — it’s just not in our nature. Quite a conundrum, isn’t it? I know there are some outdoor kitties who do hunt for their own food, but that is not the case for most pet cats and especially for those of us who are pampered, indoor kitties. 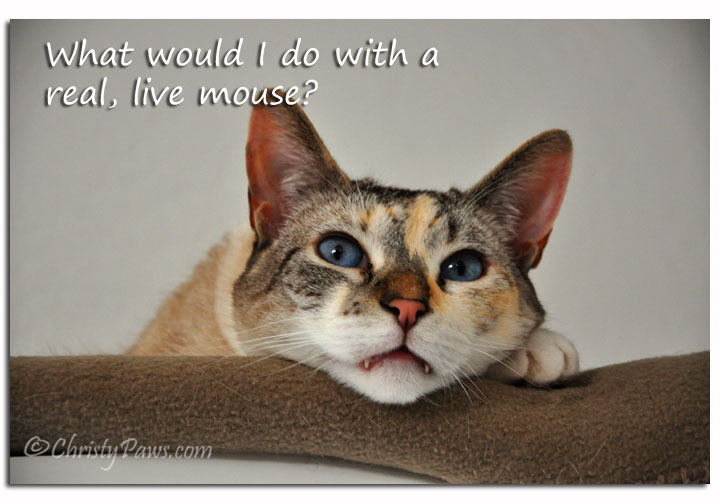 I, for one, wouldn’t know what to do with a real, live mouse. I mean, I could hunt it and play with it, but eat it? I just don’t know. So, how can you get more water in to us kitties? Here are a few ways mom has tried and one she hasn’t. We need a fountain! Put extra water in wet food. Some cats, including me, like it pretty soupy. Have you noticed your kitty licking off the gravy? If you must feed dry food, try adding water or broth to it. Make sure the water bowl is always clean and full of fresh, cool, filtered water. Keep multiple bowls around the house. Keep your water bowls away from the litter box. Put some ice cubes in the water. Try a fountain – some cats like running water and fountains stay cool and fresh. So, what’s all the fuss about water anyway? Why do we need it? Our kitty bodies are about 80% water, even more than humans at 60-70%, so it is especially important for us to get enough water. We lose water when we potty and through our paws when we sweat. If we don’t replenish it, we can get dehydrated. Mom explained all this to me and I still didn’t get why it was so important, so she told me this story. Many years ago, she had a male kitty named Chelsa. One day she came home from work and he didn’t come to greet her as usual. She found him under a chair and when she went to pick him up, he let out a blood-curdling scream. His abdomen was very distended and he was really angry. Mom right away took him to the emergency vet. He had a urinary obstruction and was in the hospital for several days. He was very lucky and fully recovered. In those days, mom didn’t know any better and fed a completely dry diet. The vet told her that was very likely the cause!!! Mom immediately switched to a combination wet and dry diet with a dry food low in ash. Wow, who knew lack of adequate water could lead to serious health problems? And to complicate the issue even more, according to Jean Hofve, DVM, at Little Big Cat, not all water is the same. She says, “Municipal water generally contains chlorine by-products, fluoride, and harmful contaminants such as bacteria, arsenic, toxic pesticide residues, heavy metals, and even rocket fuel.” Using a filter, even a faucet-mounted one like we have, will remove many of these impurities, making the water safer for us. So, kitties, drink your water — stay hydrated, stay healthy! Bonus idea from Playful Kitty: Flavor your water with catnip. Click here for a recipe for catnip tea. It’s good for humans, too. Who knew? Tagged cat, cat photos, Christy, drink more water, hydration, water. Bookmark the permalink. Hello Christy, yes it’s really true that the water is one of the important sources for being healthy. My kitten is also not drinking more water. Thanks for sharing such useful blog I will take care of this tips. I have a water bowl and a fountain. You gave some great tips for encouraging drinking, but I don’t recommend adding water to dry food…it turns it into nasty mush. Pawsum posty Christy. Yous lookin’ quite bootyful today. We sure hope y’all can win da fountain fwum Fur Everywhere. Or maybe yous mommy can find yous one. Or…Maybe when PetSafe introduces their new one later this year, maybe yous can win dat one fwum us. Weez hope yous stay purrletny hydwated in any case. Those are great tips! Right now, I giive the kitties Spring water from a bottle, but I would like to get a faucet-mounted filter, too. We have a fountain, which all of us love – plus we eat only canned food. Hydration is important! The mom tries to get extra water into us. She adds a little water to our canned food and we have a fountain. too. I am very glad that we have a well. My Mom gives her kitty bottled water because she doesn’t trust town water. Mommy had a before cat a zillion years ago who got really sick from eating just dry foods. He could has had wet, but he did not like it/ Converting him to wet food was a real hassle and Mommy made sure that no cat would be allowed to just eats dry. If any of us starts, the dry food disappears. We also gets warm water in the wet food to “bring it up to Mouse temperature”. Yes kitties, hydrating is impawtant! Thanks for this impawtant post Christie! Your mom definitely knows what kitties need and like!